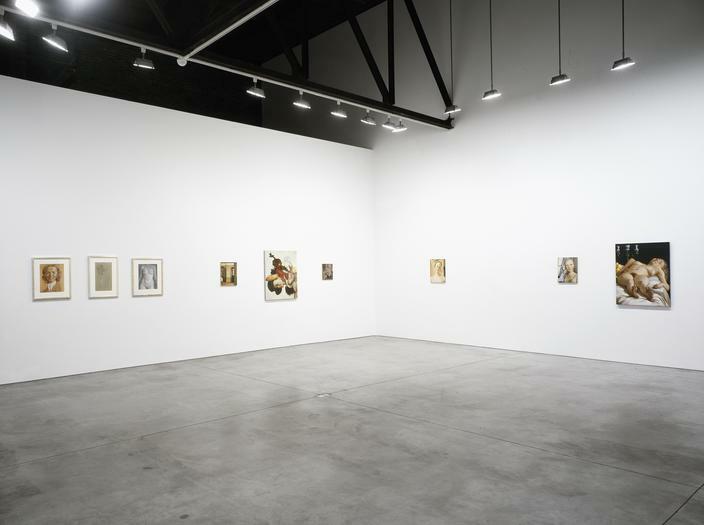 John Currin works both with and against the expectation of each genre combining imaginary and observed appearances. These new works explore how content is embedded in the formal practice of the painting even more so than in the narrative. Having had each painting in the studio over a long period of time has allowed Currin work different aspects of each painting in a range of techniques. Currin is interested in the slow consciousness these paintings have as a result and in how beauty is found within the physical mystery of the work. At times, Currin's work has been aggressively imaginary. Increasingly, Currin is also working from observation. One might assume that recording the observed would risk a mundane classicism. Although it is not important for the viewer to know what aspect of the painting is observed versus imagined, Currin found that actually looking at things liberates your imagination more than having to make something up. These paintings illuminate the difference between imagining something and looking at something and the parody of unawareness and awareness. All of these shifts developed purely from working on the paintings one month to the next. The paintings evolved through a certain pleasure of each surface.